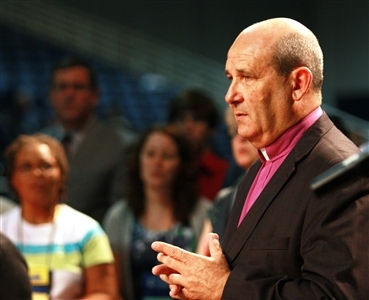 These are exciting days for Bishop Ricardo Pereira and the Methodist Church in Cuba. The church has more freedom than it has in 50 years and is growing at a rate that would be the envy of any denomination in the United States. In fact, the Cuban Methodists are doing something that would have been unthinkable not so long ago – sending missionaries overseas. A Cuban couple recently was sent, with assistance from the Florida Conference, to East Angola as evangelistic and medical missionaries. “When the government relaxed the rules on the churches in 1997, as a dream we said one day we are going to send missionaries from Cuba. At the time we had little faith it would happen, but now the people are really excited,” said Pereira in an interview, speaking through an interpreter. “I know I can speak for the people of Florida when I say what a blessing in has been to be in contact with the people of the Methodist Church in Cuba,” he said. In a lively sermon, Pereira told the appreciative audience that following Jesus is like a party to which he invites us. Pereira told the audience that in the past 12 years, the Methodist Church in Cuba has grown from 9,000 members to 30,000 members. Citing the apostle Paul’s greeting from the house of Caesar, Pereira said, “We are not going to stop until we say, ‘Those in the house of Fidel and Raul greet you,’” a reference to the Castro brothers who have ruled Cuba since the early 1960s. Earlier in the day, Pereira reflected on the hopeful situation of the Methodist Church in Cuba. He said for the past 12 years, it has experienced 10 percent membership growth annually and 15 to 20 percent growth in worship. It is a matter of training people for personal evangelism, he said. “We teach our members to commit themselves to preach the gospel. When someone converts, they are learning to be filled with the Spirit and witness,” Pereira said. 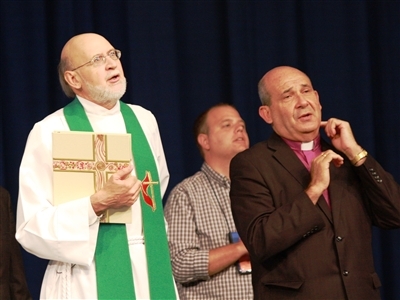 It’s a lesson Pereira said he hopes the Cuban church can teach to Methodists in Florida. “Due to our limitations, we have to do evangelism as a personal witness. The freedom you have here makes people feel more secure, but in the Cuban scenario, our people have to continue knocking on doors. That’s what we’d like to see here,” he said. Growth has its own challenges, mainly in training enough pastoral leaders and paying them adequately given a struggling Cuban economy. The partnership with the Florida Conference is helping on both counts. The offering collected at Thursday’s worship service will be divided among the Conference’s three overseas church partners, with 30 percent of the offering going to help the Methodist Church in Cuba with its four-year-old seminary in Havana. Pereira said half of the money received will be used to feed the seminary students, and the other half will be used to build houses for the professors. In a somewhat surprising gesture, the land for the houses was given by the Cuban government. The political situation in Cuba has been evolving, with Raul Castro taking over the presidency from his brother, Fidel. Gradually, the hostility of the government toward religion has loosened, allowing churches to practice their faith more freely. Pereira said there has been further improvement in the Methodist Church’s relationship with the Cuban government in the past few years, which he attributes to visits to Cuba by Florida Bishop Timothy Whitaker and Conference Director of Global Mission Icel Rodriguez. In a further boost, the United States government announced recently that it will relax restrictions on groups traveling from America to Cuba, including religious groups. That means the partnership between Methodist churches in Florida and Cuba, formalized in 1997 but cramped during the Bush administration because of travel restrictions, may begin to flourish again. The partnership between the two Methodist conferences, known as Methodists United in Prayer, is exploring new ways of strengthening the bonds between them.